This national standard is made up of 5 diagonal stripes. The center features the black color with a yellow stripe above as well as below it. The bottom stripe is blue in color and the top one is colored green. The Tanzanian flag was officially hoisted on national flag poles on June 30, '64. This standard is derived from the Zanzibar and Tanganyika flag. Zanzibar and Tanganyika came together to form Tanzania at some point during the month of April of '64. Zanzibar’s flag was a horizontal striped tricolor of green, black, and blue. Tanganyika’s flag was a green background with a central horizontal black stripe with a yellow edge. 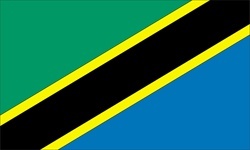 Tanzania chose the diagonal design with the central yellow-outlined black strip to show equality to both of the flags. An interesting fact about this country is that the main language is Swahili. The main religion practiced is Islam, whereas on the mainland the beliefs are approximately thirty percent Christian, thirty-five percent Muslim and thirty-five percent indigenous beliefs.